Guilt Free Za – So… What Should We Make? So… What Should We Make? I’m going be honest…I LOVE pizza. So much that I’ve started calling myself the Za queen, and I wear that title with pride. I often find myself getting caught in the middle of my brain telling me to eat better and my heart yearning for some greasy za. 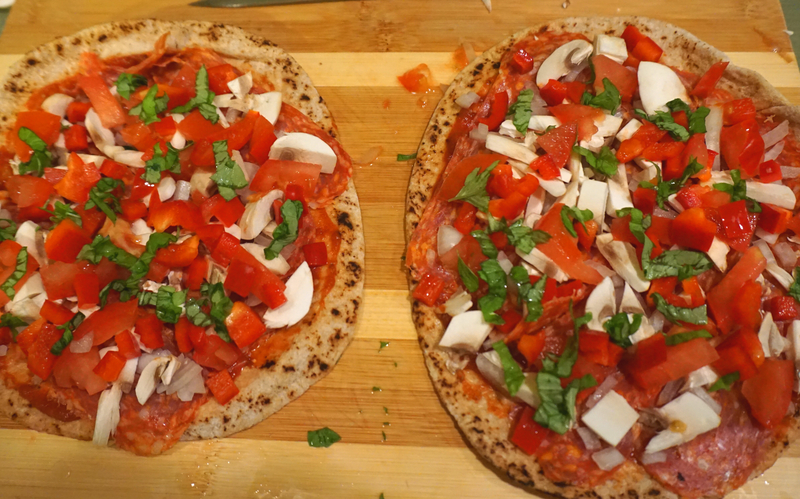 Thankfully these homemade pizzas are a much healthier alternative to what you’d order in or eat out at a pizza joint. Don’t worry though – just because they’re healthier doesn’t mean they skimp out on flavour. I started making these a few years ago when I was still in university because they were quick, cheap and delicious, and they’re still one of my go to’s when I don’t want to spend a lot of time in the kitchen after a long day. Not to mention the fact that I definitely have a za addiction, which is why I always have a pack of thin pitas on hand in my freezer. The recipe i’m providing below should be used as a loose guideline to create the pizza of your dreams – just try to keep yourself within some parameters, as I have coined it as being “guilt free” for a reason! 1. Preheat the oven to 400 degrees F. Defrost your pita if you’re pulling it from the freezer. 2. Cut all of the veggies to your liking. In my opinion, finely chopped veggies work best with smaller pitas. 3. Chop one garlic clove finely (or use a garlic press if you can) and combine with 1/4 cup tomato sauce. Spread sauce evenly over the pita, leaving an outer circle free of sauce to form the crust. 4. Add calabrese/the meat of your choosing first, followed by veggies. If you’re following my recipe, chop up the basil finely and put a generous amount over the pizza once you’ve finished adding veggies. 5. Evenly sprinkle cheese across the pizza, and add any other herbs that you may like. 6. Place the pizza directly on the middle rack of your oven. Let cook for approximately 8-10 minutes, or until the cheese is bubbling and the crust is crispy. 7. Let your pizza rest for at least 2-3 minutes before you attempt to cut it, or it may fall apart. I use scissors to cut my pizza, i’ve been told that it’s the Italian way of doing things and it really makes the process so much easier! If you like a kick in your pizza and aren’t using spicy salami, sprinkling pepper flakes on top will do the trick. You can also add finely chopped jalapeños – either of these will give off a balanced amount of heat. Mmmm, I think you’ll really like these. Play around with the ingredients for variety, and you’ll never get sick of them!